Epithelial tissue, connective tissue, muscle tissue, and nervous tissue are the four basic types of animal tissue. Both tissue types consist of specialized cells and extracellular matrix. The cells in the epithelial tissue are organized into one or more cell layers. But, connective tissue is composed of more extracellular fluid and cells in the tissue are scattered throughout this matrix. The main difference between epithelial and connective tissue is that epithelial tissue lines the cavity and the surfaces of organs and blood vessels throughout the animal body whereas connective tissue supports, connects and separates different types of tissues and organs in the body. Epithelial tissue lines organs, vessels (blood and lymph), and cavities by forming a thin cell layer called endothelium that is continuous with the inner tissue lining of the body. The free surface of the epithelium is exposed to air or fluids while the bottom is attached to the basement membrane. The epithelial tissue acts as a barrier to microorganisms. The epidermis that forms the skin protects the body from dehydration and damage. The epithelial tissue is also involved in the secretion, absorption, and excretion. Enzymes and hormones are secreted by the epithelial cells in glands. The intestinal epithelial cells absorb nutrients. Kidney epithelial cells excrete wastes. Epithelial cells in ear, nose, tongue and skin have a sensory function. Ciliated epithelial cells in respiratory and reproductive tracts propel substances like dust particles and female gametes respectively. Three principal shapes of epithelial cells are found: squamous, columnar, and cuboidal. Squamous epithelial is flat tile-like. Columnar epithelial cells are shaped like bricks, and cuboidal is dice-like. These cells are arranged in three ways: simple, stratified, and pseudostratified. Simple epithelium contains a single layer of cells. 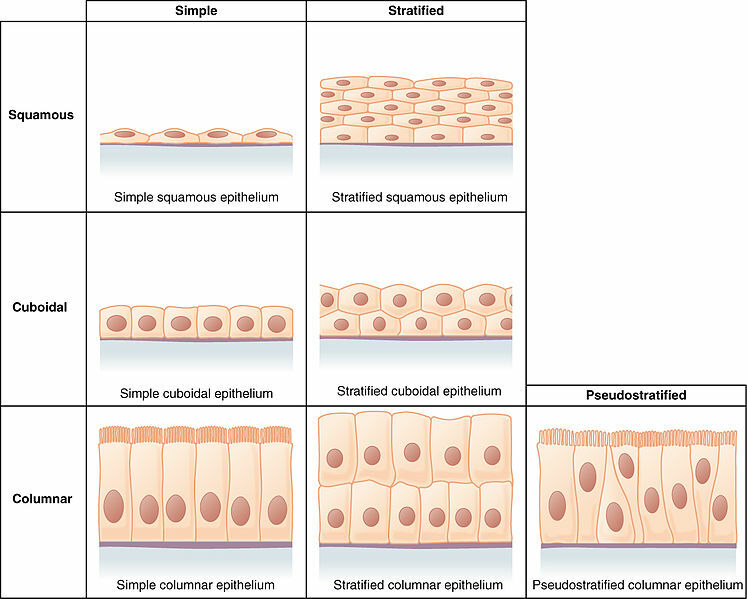 Stratified epithelium contains multiple layers of cells, and pseudostratified epithelium contains a single layer of cells of which the nuclei are arranged in different levels. The classification of epithelial cells is shown in figure 1. The connective tissue connects and supports other organs and tissues by filling space between them. It also provides metabolic support to the organs and tissues. The cells and extracellular matrix make up the connective tissue. The extracellular matrix is made up of fibrous proteins and glycoproteins which are attached to a basement membrane. The composition of the extracellular matrix determines the properties of the connective tissue. A section of the epididymis is shown in figure 2. The connective tissue is shown in blue. The supported epithelium by the connective tissue is shown in purple color. Connective tissue is divided into connective tissue proper and specialized connective tissue. Connective tissue proper is subdivided into loose, irregular connective tissue and dense irregular connective tissue. Loose, irregular connective tissue consists of loosely arranged fibers with many cells. 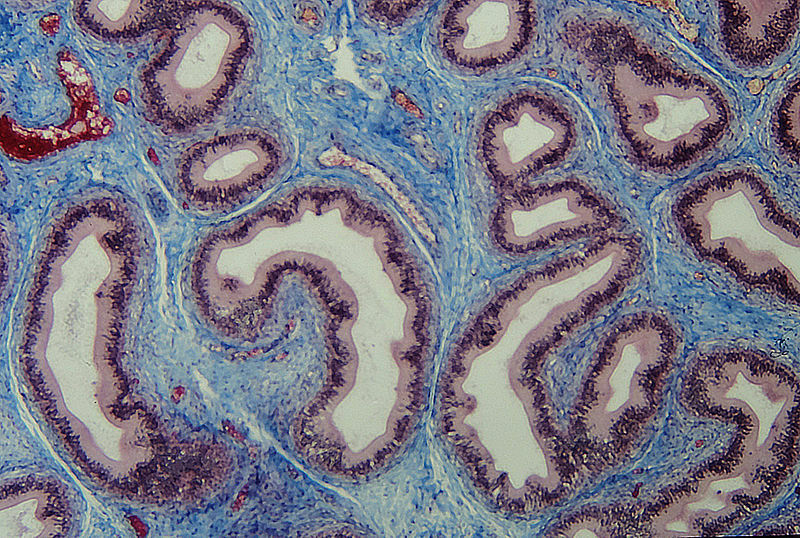 Lymph gland is an example of loose irregular connective tissue, composing of plasma cells, finer elastin fibers, and thicker collagen fibers. Dense irregular connective tissue contains a dense woven network of collagenous fibers in a viscous matrix. 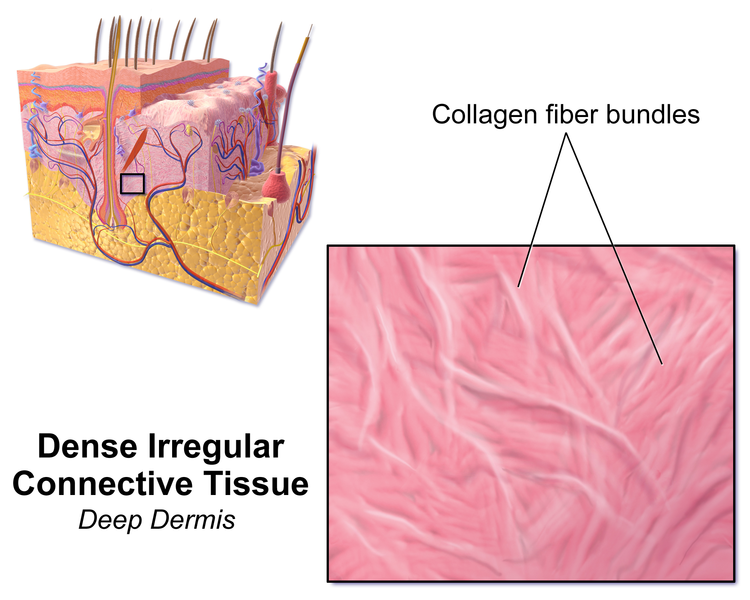 Dermis, muscle fascia, and joint capsules contain dense irregular connective tissue. Cartilage, adipose tissue, hematopoietic tissue (bone marrow and lymphoid tissue), blood, and bone are specialized connective tissue. The dense irregular connective tissue in the skin is shown in figure 3. Epithelial Tissue: Epithelial tissue line the cavity and surfaces of organs and blood vessels throughout the animal body. Connective Tissue: Connective tissue supports, connects and separates different types of tissues and organs in the body. Epithelial Tissue: Epithelial cells are closely packed together. Connective Tissue: Connective tissue cells are scattered throughout an extracellular matrix. Epithelial Tissue: Cells in the epithelial tissue are arranged either in single layers or multilayers. Connective Tissue: Cells in the connective tissue are spread throughout the tissue. Epithelial Tissue: Epithelial tissue occurs above the basement membrane. Connective Tissue: Connective tissue occurs below the basal membrane. Epithelial Tissue: Epithelial tissue is developed from ectoderm, endoderm, and mesoderm. Connective Tissue: Connective tissue is developed from mesoderm. Epithelial Tissue: Epithelial tissue serves as a barrier over microorganisms and dehydration while secreting excreting and absorbing substances. Connective Tissue: Connective tissue supports and connects organs and tissues. Epithelial Tissue: No blood capillaries are found in the epithelial tissue. Connective Tissue: Connective tissue is encompassed of blood capillaries which absorb nutrients. Epithelial Tissue: Epithelial tissue is found in the skin, glands, organs, mucous membranes, and organs like kidney and lungs. Connective Tissue: Connective tissue is found in adipose, bone, ligaments, tendons, nerves, cartilage and muscles. Epithelial tissue and connective tissue are two basic types of tissues found in animals. Both tissues conjugate with each other during functioning in the body. Epithelial tissue covers the animal body by forming a skin. It serves as a protective barrier against microorganisms and dehydration. Some secretory, sensory, excretory functions are also done by epithelial cells. Connective tissue supports other organs and tissues in the body. It absorbs nutrients from the blood and makes them available to other cells in the extracellular matrix. Thus, the main difference between epithelial and connective tissue is their function in the body. 1. Bailey, Regina. “Why Epithelial Tissue Is Important.” ThoughtCo. N.p., n.d. Web. 24 May 2017. <https://www.thoughtco.com/animal-anatomy-epithelial-tissue-373206>. 2. Paxton, Steve, Michelle Peckham, and Knibbs Adele. “Connective Tissue.” The Leeds Histology Guide. N.p., 01 Jan. 1970. Web. 24 May 2017. <http://www.histology.leeds.ac.uk/tissue_types/connective/connective_tissue_types.php>. 3. Bailey, Regina. “Blood and Other Types of Connective Tissue.” ThoughtCo. N.p., n.d. Web. 24 May 2017. <https://www.thoughtco.com/connective-tissue-anatomy-373207>.